First and most importantly, let’s address the issues that could affect our match on Saturday. This victory had a heavy cost associated with it. First, we lost Bertolacci to a muscle injury in the 33rd. Next up and most frightening was when Alex took a knee to the side of the head from Donnarumma in the 49th. He was obviously knocked unconscious instantly, before he even fell to the ground and had to be stretchered off. Reports are that he regained consciousness in the locker room before being taken to the hospital, but he will likely be kept overnight at least for observation. Best wishes to our defensive warrior. Lastly, after our third sub had been used, Montolivo motioned that he had also pulled up. Some magic spray and treatment on the sidelines saw him re-enter the pitch and play to the final whistle, but there is obviously some doubt as to his fitness for next week. Additionally, Bonaventura will be suspended for card accumulation, so that’s four starters out or in doubt for Saturday. Get better soon, big guy. We need that head of yours. And maybe that was the catalyst they needed, because Cerci’s next shot went straight to Marchetti, who was unable to hold it, and Bertolacci sent the rebound in for the opening goal. 1-0 Milan. The ex-Roma youth scored against Lazio. It was a cruel twist of fate that after scoring, Poli had to be sent on for him just eight minutes later, as he had pulled up. And it seemed like the bad luck would continue when Donnarumma gave us a scare in the 35th, coming way off of his line. And Cerci’s luck would continue when he sent in a brilliant shot across the goal, only to hit the post in the 37th. But they would pull together and fight to the finish, their cohesiveness growing rather than waning. Not even Mihajlovic’s son Dusan serving as a ballboy could distract them. The second half started even more brutally than the first, with Alex being stretchered off & Mexes replacing him in the 51st. But less than two minutes later, Mexes did the unthinkable: he headed the ball into the back of the net on his first touch of the game. The ex-Roma warrior haunting Lazio again (but this time on the right place in the referee’s report.) 2-0 Milan. It was getting easier to breathe, and despite constantly rinsing out my eyes from those infernal kits, I could still see that this was finally starting to look like a team. They had confidence and trust in each other, and it was washing away the petty errors and poor play we had seen as recently as midweek. Not even the introduction of Matri by Pioli could find a chink in this team’s armor. Although a delay in game in the 76th because the ref needed assistance with his equipment may have cooled us down just a little. Still, with that level of confidence, it was thrilling to watch Bacca speed through defenders and around the keeper in the 79th to make it 3-0 Milan. 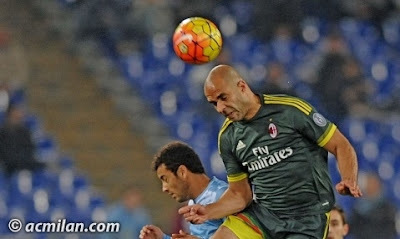 From a Bonaventura assist (his 5th on the season, top of Serie A.) But maybe our confidence was a little too high. Or maybe subbing off the indomitable Cerci for a mere human in Honda is what did our clean sheet in. In any case, it was in the 84th, having had a goal disallowed for offside ten minutes earlier, Kishna found the chink in our armor and pulled one back for Lazio 3-1 Milan. 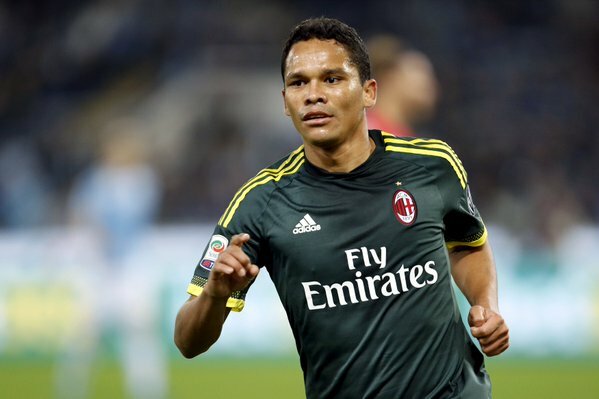 The thing is, having two clean sheets in a row would have been more than miraculous for this Milan side. But at the time that we conceded, I don’t think fans really cared, because we were still achieving the impossible. There were six minutes of stoppage time, due to Alex’s head injury and the ref’s equipment troubles, and despite conceding one goal, the team refused all of Lazio’s efforts. At home. In their house. Where they put that eagle out to fly around the stadium before every match. We held on for a convincing victory. Convincing not only the table, and football fans everywhere, but also ourselves. 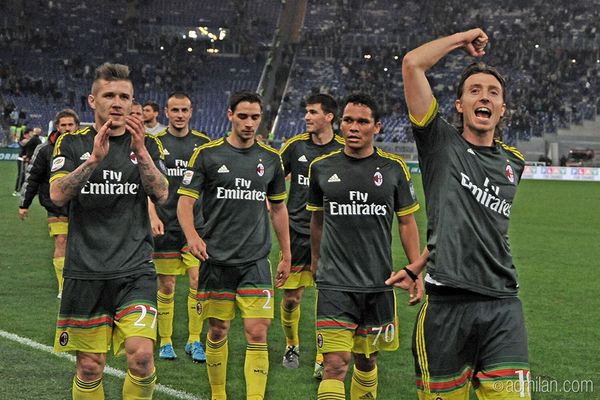 That this Milan team can do it, despite all of our many problems (and even injuries.) We won’t win every game, we may not even achieve our goal of qualifying for Europe. But with a couple of ugly wins and wearing some even uglier kits, we just might even surprise ourselves. We leapfrogged our opponents, were the first to beat them in their house this season, and have climbed seven spots on the table in just three games. Sorry, Lazio, but the Eagles have landed. Oh, and good luck with Matri.